It is somewhat surreal to be gently carried by the current of a crystal-clear river, surrounded by swarms of fish that treat you like a log of wood. They come so close that touching them seems only a matter of moving your little finger. Of course they would be too fast, and, in any case, the teeth of a meter long dorado do not invite close inspection. Looking back, this is my favorite memory from visiting Bonito, in Mato Grosso do Sul. Bonito was recommended to us by so many Brazilian friends as a “Have to visit” place, that we were slightly apprehensive. In the past, our perception as to what was “muito legal” had somewhat differed from theirs. Still, as we were told that many people would go for Christmas, we booked our passeios – trips – ahead which did nothing to dissipate our doubts. And while most of these trips had the potential to not suit our free-roaming minds – happening only in groups, accompanied by a guide, and at fixed times – we found it to be an overall enjoyable experience. In a good sense, one could describe tourism in Bonito as ‘German style’. Everything is very organised. Transport to & fro was very much on time, on the spot were restrooms, restaurants and relaxation areas. Starting 20 years ago, Bonito has become one of the top destinations for eco-tourism, thanks to a ‘one voucher, one price’ scheme which limits the number of tourists who can access the protected, private areas per day. 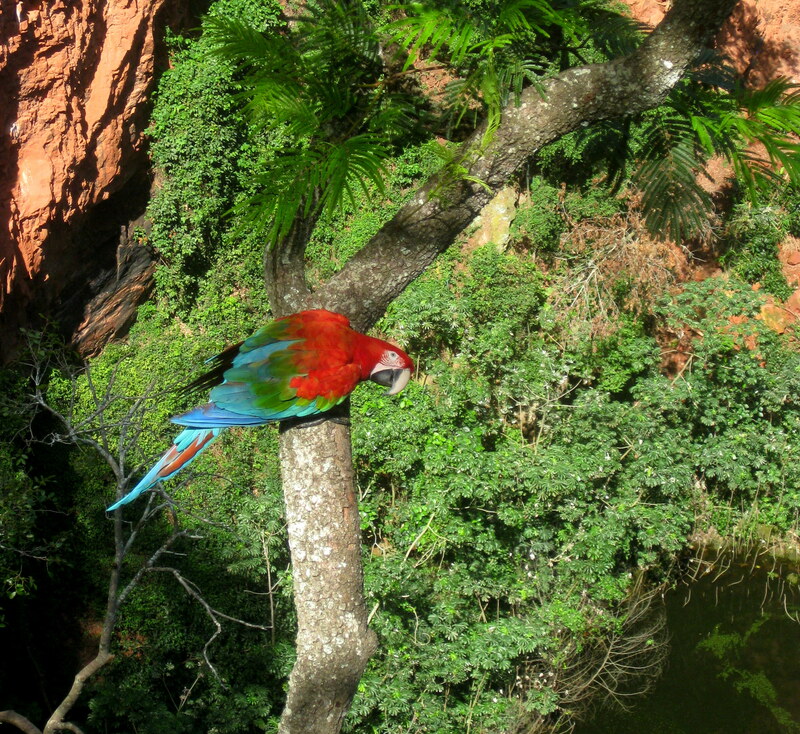 These areas include trails along waterfalls, giant sinkholes home to dozens of red-green macaws and crystal-clear rivers harboring huge dorados, pintados and pacus. The fact that everything is neatly organized takes a bit the adventure out but it has the advantage that nature is protected from the people and the people from themselves. In the end, we did several trips: two trails along waterfalls, three times snorkeling in rivers, and of course, watching dozens of macaws circling around when not cautiously eyeing tourists. I have no proof to back this claim up but there seems to be an unwritten law in Brazil that events – a holiday trip, an evening out with friends, a nice dinner – did not happen unless there is photographic evidence. As of the youngest age, Brazilians are trained to smile at the camera which over the years converges into the same pose, the same grin repeated incessantly: Women stand slightly sideways, men as broadly shouldered as possible and both show that the money spent on the dentist was well invested. The typical Brazilian holiday picture will show themselves in front of whatever tourist attraction they happen to visit. It’s important to note that it is not necessary to be able to recognize the attraction, the person is the relevant item to be on the photo. Personally, I would not be surprised if hell was a place where you have to sit through endless repetitions of photos from the same people in front of something. Forever and ever.